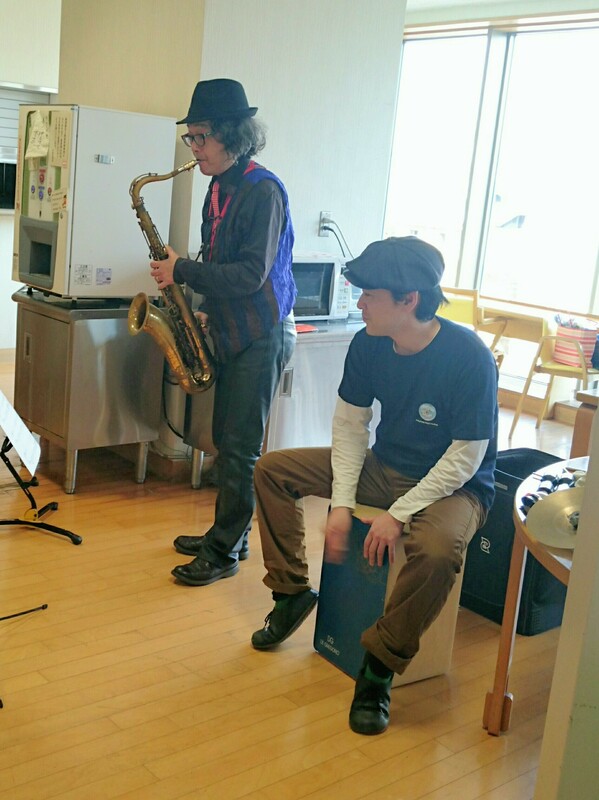 As it’s a spring vacation, many children and mothers gathered in the playroom to enjoy Mari-san’s music. A doctor joined with his violin and it was such a fantastic performance! Erhu, the chinese violin is such a unique instrument that everyone got interested right away in the apperance as well as the sound. The music score is as unusual as itself. Nurses and doctors stopped to enjoy the play too. Karakuri paper craft is something! Cut, fold, set up then play with it. Some children designed on their own after learning how to make it. Children liked the rhythm of Bossa Nova. 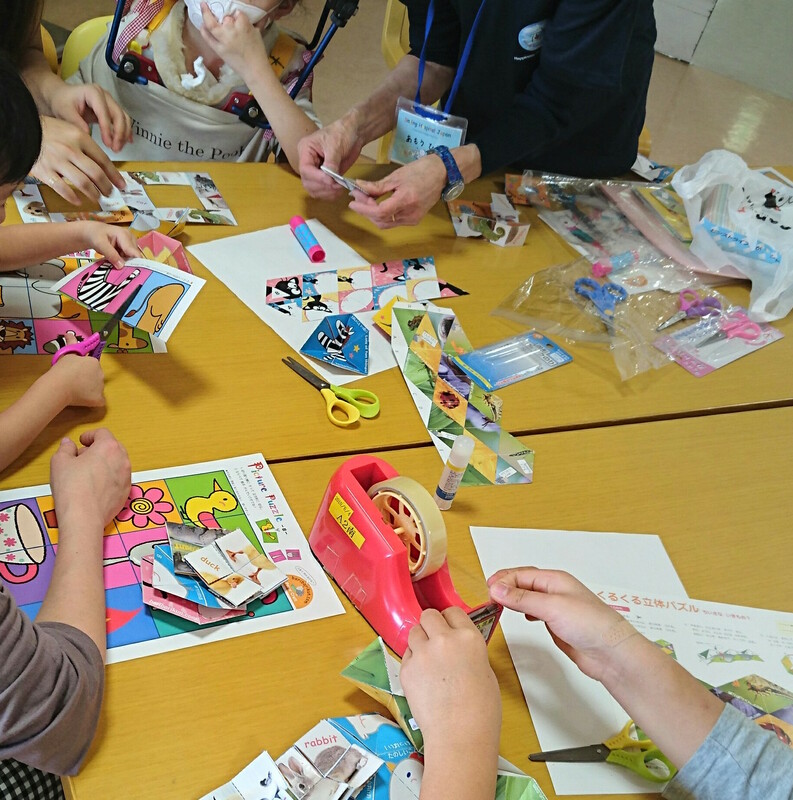 Session was successful by all the children with Satoko & Kaori. 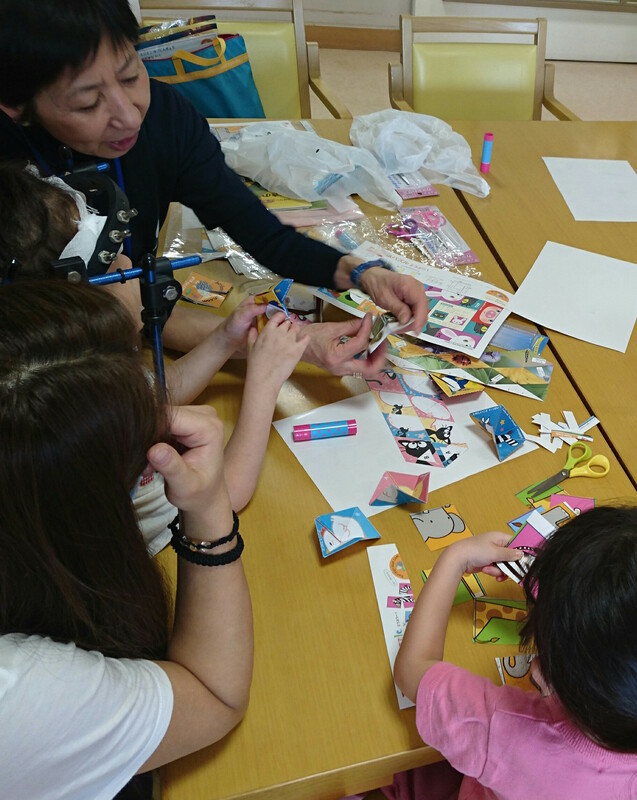 Satoko sang and played the guitar, Kaori played the Makoto and kids played the tambourine, maracas and etc. Makoto is like the harp but the sound was so reluxing and tender that everyone tried to touch it one by one. 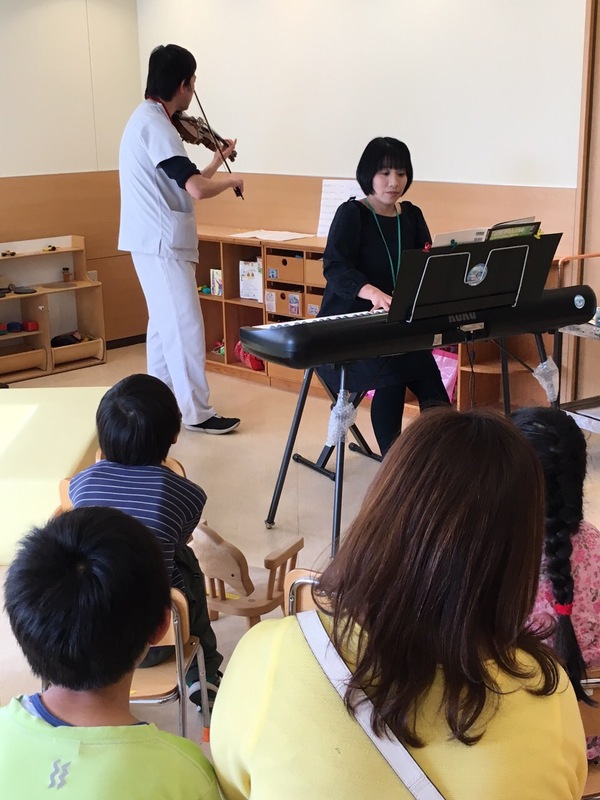 Satoko played the Bossa Nova standard number like “A Girl from Ipanema” , which made a nurse and a father enjoy as well as kids. 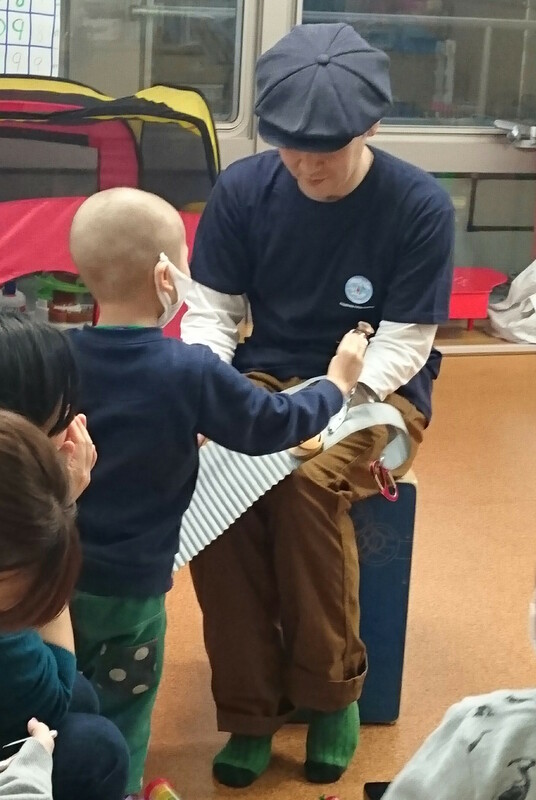 “Will you come tomorrow?” “When is your next visit?”　Children’s words always makes artists feel happy and look forward to the next visit. Satoko-san sang with her guitar walking around each bedside. 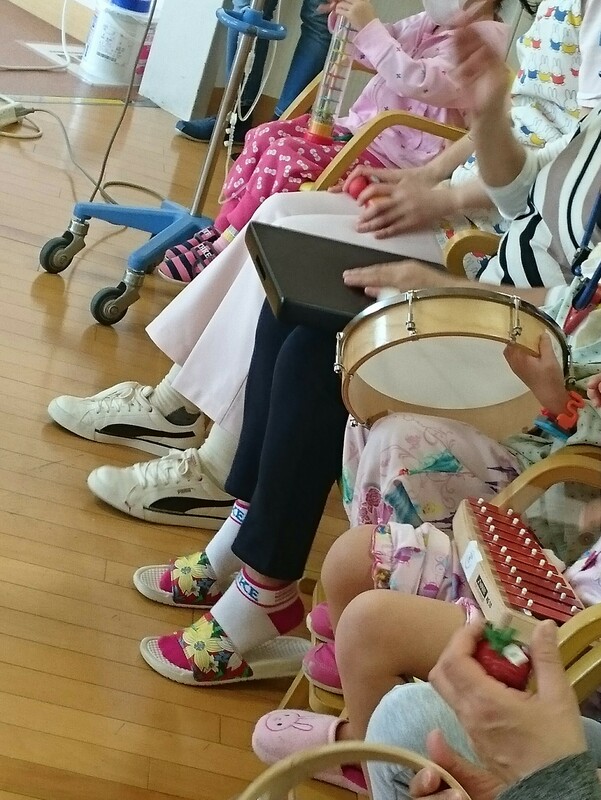 Singing like talking is her style and it always heals not only children and mothers but medical staff members. Alto & soprano saxophone, cajón, rainstick, drum, glockenspiel, egg shaker…unique insruments gathered for children. Everyone enjoyed seeing, touching and playing them choosing and changing on his/her own. They really had such a wonderful time that most of the children didn’t leave the playroom when the activity was over.